A party for Israel’s 70th birthday drew written and in-person protests last week. “I do not like the fact that they are creating settlements in what is considered to be Palestine territory, and the treatment of Palestinians within these settlements in their own country are terrible,” Maggie Murdoch’18 said. “It’s a humanitarian crisis that needs to be dealt with, in my opinion, and that is the reason I’m here.” Both students said that they have protested at other events on this issue before. 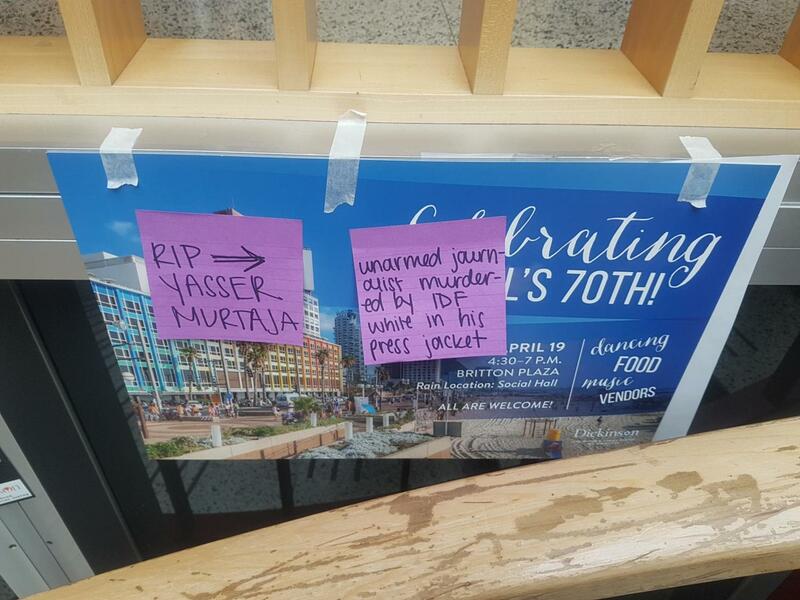 The posters advertising the event had sticky notes stuck to them also highlighting Palestinians killed by IDF. Two notes where used to mention Yasser Murtaja, an “unarmed journalist murdered by IDF while in his press jacket,” according to the notes. The KOVE in the dining hall was also decorated to celebrate the holiday with several Israeli flags. This drew complaints written on napkins posted on the corkboard in the cafeteria, where one student requested “[p]lease don’t politicize the KOVE,” and another read “I’d like my KOVE food without a side of Israeli propaganda, please.” Director of Dining Services Errol Huffman could not be reached for a comment by print time on Wednesday, April 25, at 1:26 a.m. The protests did not stop students from gathering on Thursday, April 19 in the social hall of the Holland Union Building to commemorate the country’s birthday. The event was attended by over 75 people and included both a variety of activities and a selection of Middle Eastern food, including pita, hummus, tabbouleh and falafel. One booth provided henna tattoos, while another allowed students to braid their own challah bread and the Dickinson College Farm had a stand selling yarn, soap and pickled vegetables, among other products. Students were dancing and listening to music, as well as waving Israeli flags, which some students wrapped themselves in.